The former Poor Clares Monastery at 2012-30 West Girard Avenue is slated for demolition. The site, part of the Girard Avenue National Register Historic District, has been vacant and neglected for years by absentee owners who are now proposing two new apartment buildings on the site. Their plan for 42 new 800-square-foot units and a 16-space parking lot requires a number of zoning variances and has been met with significant opposition from neighbors in Francisville and Fairmount. However, the buildings are not listed on the Philadelphia Register of Historic Places, meaning the buildings can be demolished without the approval of the Philadelphia Historical Commission or any assurances that new development would follow. Owners have cited L&I building violations as justification for the demolition– violations caused by their own negligence in securing and maintaining the buildings. And now they seek to profit from this neglect by speculating on out-of-character new construction, despite the fact that the site is a prime candidate for adaptive reuse and eligible for federal preservation tax credits. The site sits directly across from Girard College and is an important gateway into Francisville. 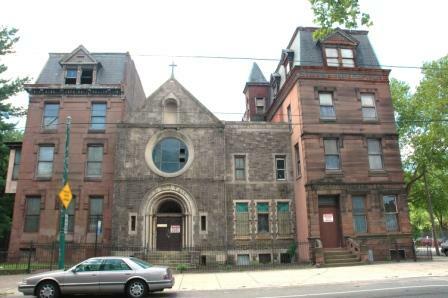 It includes two c.1890s brownstone townhouses linked by c.1918 Romanesque stone chapel. From 1918 to 1977, the site was home to a contemplative order of Franciscan nuns known as the Poor Clares. Never has a building’s name so sadly matched its fate. If anyone has photos of the interior, we would love to hear from you. Unlisted: A. Pomerantz & Co. This is a gem that should be cherished not plowed under. The history of the contributions of the Poor Clares, plus the raw architectural beauty of the structure should be valued and respected. Beyond that, the community has spoken, has expressed their vision for the property, and has voted overwhelmingly against the developer’s proposition.